In small towns like Ray City, the circus was a big event. 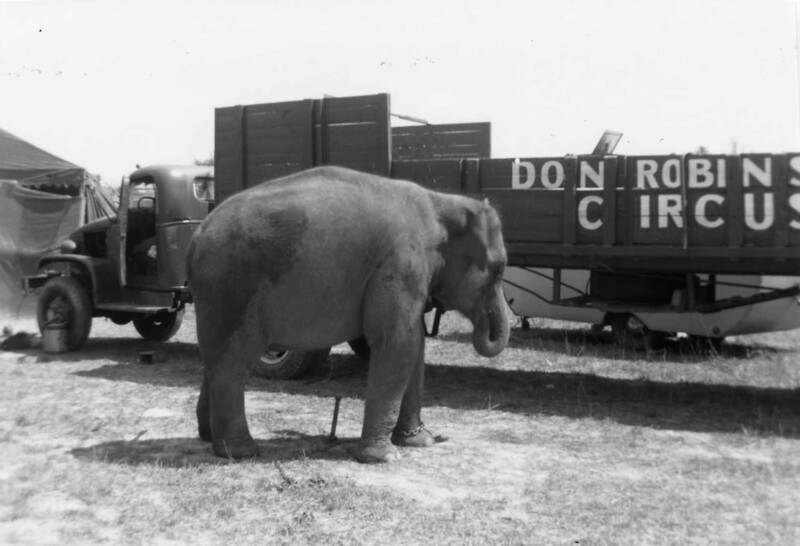 In the winter of 1952, the Don Robinson Circus came to town. The Billboard magazine, and entertainment industry trade journal, published an announcement about the Don Robinson Circus in the November 29, 1952 edition. 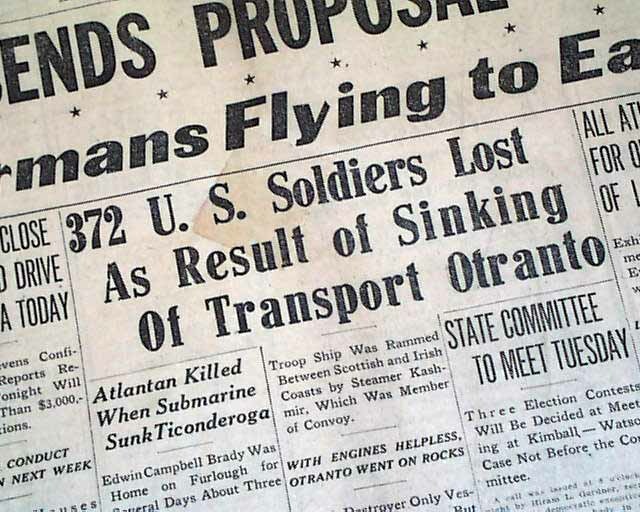 The story, filed from Ray City, GA, described the line up of acts, and was probably written by circus advance man Charlie Campbell, who traveled a week ahead to make arrangements for the show. Ray City, Ga., Nov. 22. – James Spiegle, operator of the Diamond Jim Circus for the past several years, has acquired the Don Robinson Circus title and opened under the latter name at Sparks, Ga., November 10. The show will close at Dixie Union, Ga., December 15, and reopen about Jan 15 as a three-ring show, it was reported. 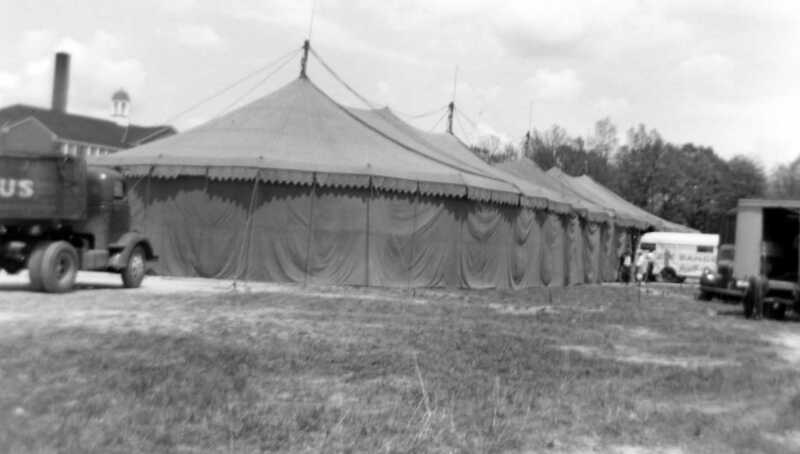 The Diamond Jim Circus operated in the South as a one-ring show. 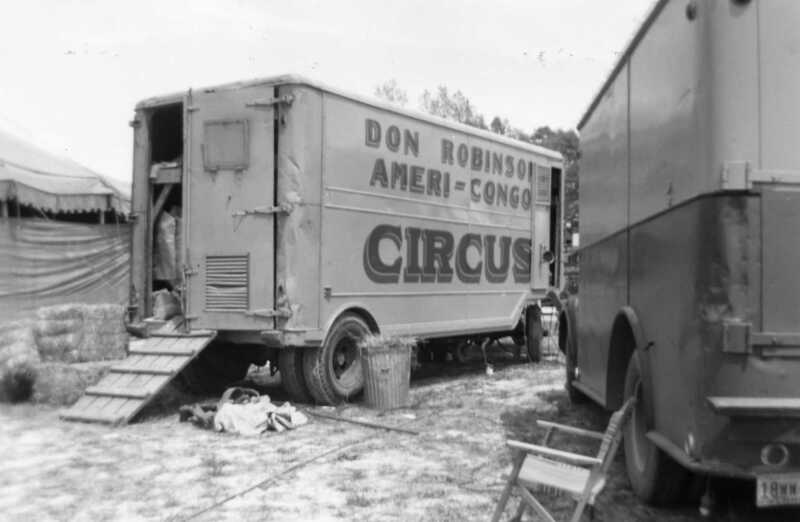 Don Robinson Circus was out in 1951 under Howard Ingram and Eddie Billetti and was built from the Ameri-Congo Animal Expedition. With the present Don Robinson show are Captain Forkum’s Lions, Minnie Spiegles Dogs, Billy Sheets, equestrian director and tight wire and Lou Walton, producing clown. Menagerie consists of four cages. There are seven horses and two donkeys. Boss canvas-man Shorty Rhine has a 70 with a 40 and two 20s. Sound truck makes downtown bally. General Agent is Charlie Campbell and M. Bailey has the bill car a week ahead. Most stands are sponsored by Parent-Teachers associations. Don Robinson Circus at an unknown location, circa 1952. In an automobile wreck that occurred a few miles west of Sparks Sunday night about ten o’clock Mr. Rema Sirmans of Ray City received a broken nose and severe gashes about the face and Andrew Ellis owner of the car received a cut on his right arm. Both gentlemen required medical attention, which was furnished by Dr. Clements of Adel who was called to the scene of the accident. The boys were said to be coming into Sparks and upon attempting to make a curve the car, a Ford roadster turned into the ditch and struck a pine tree and Mr. Sirmans was thrown out through the windshield, and his face struck the tree and for several minutes was rendered semi-conscious. Dr. Clements was called to the scene of the accident and the boys were carried to Adel where their wounds were attended to. The car was badly damaged. 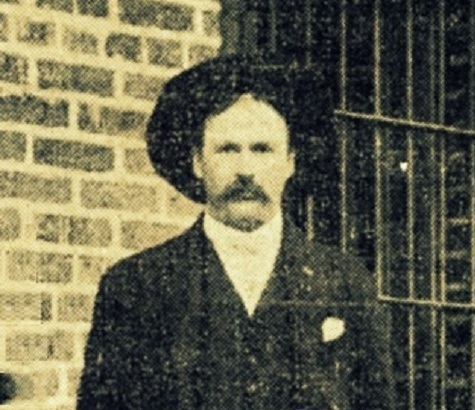 Henry W. Clements was a Physician who lived and practiced in Ray City, Georgia during the early days of the town. He was one of the many Medical Men of Ray’s Mill (now Ray City), who served the community over the years. Advertisment of Dr. H. W. Clements, Physician and Surgeon. 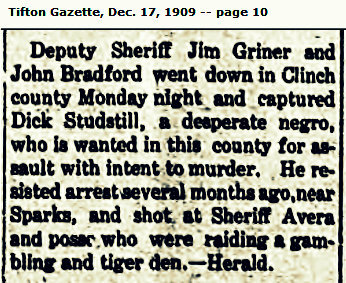 Tifton Gazette, Mar. 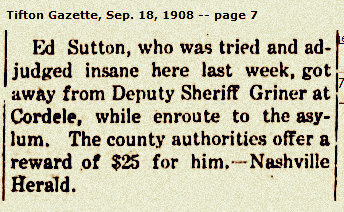 25, 1904. In 1908 Dr. Clements was admitted to the Medical Association of Georgia. 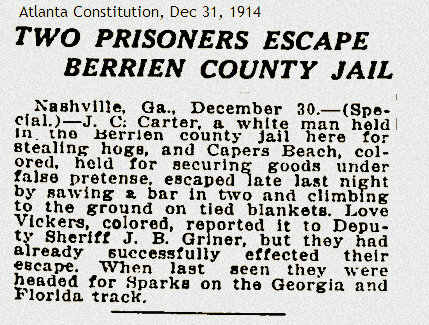 The Census of 1910 places him in Lenox, GA, but newspaper mentions show he and his wife, Pauline Nelson Clements, were back in Ray City by early 1911. Dr. Clements was a self-employed physician in general practice in Ray City. His bookkeeper was Robert Tombs Harrell and he also employed Floyd Lafayette Blanton in farming. According to the 1920 Census, Dr. Clements owned a home in Ray City on North Street, next door to his father, Levi J. Clements. Dr. Clements practiced in Hahira, Lenox, and Ray City until the early 1920’s. Transportation for these years was by horse and buggy and his stable full of horses is well known. Prior to World War I, the second gas vehicle in Berrien County was a Maxwell proudly owned by Dr. Clements. The Maxwell Motor Company produced a model called the Doctor’s Roadster, marketed especially to medical men, as seen in this advertisement from The Medical World magazine. W.P. Tittle & Co., a Nashville, GA firm from 1911 to around 1925, was the first automobile dealer in Berrien County and handled the Maxwell line of cars. The firm was owned by W.P. Tittle, C.G. Starling, and D.D. Tittle. Dr. H.W. 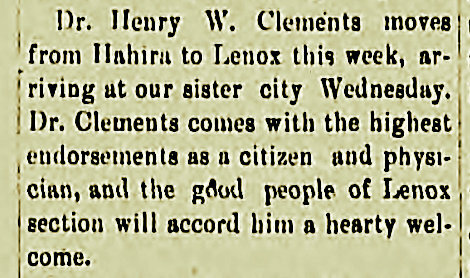 Clements lived in Ray City, GA and kept his medical practice there until he moved to Adel, GA in 1922. Adel is just 10 miles west of Ray City; Homer could have made the trip in 1923 to get his arm treated. On the night of January 17, 1929 Dr. Clements was called for an emergency response when Rema Sirmans was ejected from a Ford roadster in a one car accident near Sparks, Ga. No doubt, Dr. Clements treated many other automobile accident victims over the years. 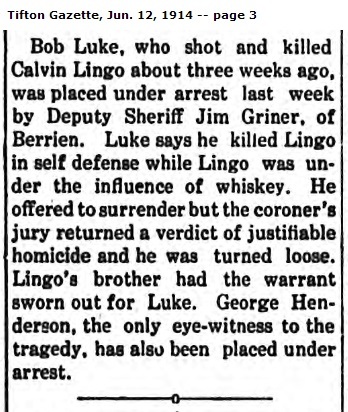 Tragically, his own daughter, Hilda Clements, and son-in-law would be killed in an automobile accident at a bridge near Ray City, on December 21, 1941. Webster defines incendiarism to be the act of maliciously and wilfully setting buildings and other combustible property on Are, and this paper will discuss the subject in the light of that definition. The ancients, in recognition of that famous medical maxim, “similia similibus curantur,” treated incendiaries with fire, that is, the incendiaries themselves were burned, to the complete vindication of the maxim just quoted. We regret that among the ” lost arts” we must number a mode of “fire prevention” so salutary and effectual. According to statisticians one third of all our fires is the work of incendiaries; they who wilfully set buildings or other combustible property on fire, and presumably two-fifths of our entire fire waste is the fruit of crime. The number of fires of incendiary origin exceed those from the combined causes of accidents, carelessness, defective construction in all its bearings, including all defects of flues, furnaces, heating and lighting apparatus, friction in machinery, gasoline and coal oil stoves, ignition, spontaneous combustion, mischievous children, lightning and the much abused tramp. 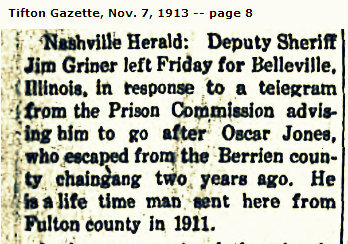 The corn crib and contents of Mr. J.J. Sirmans, of Berrien county were incendiarised. 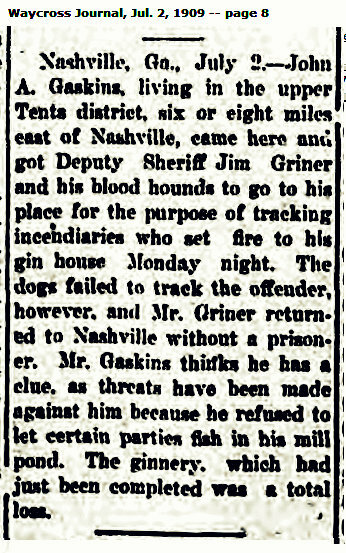 The house contained 400 bushels of corn which had just been housed, 35 bushels of oats, all his farming utensils, besides bridles, saddles and other property. I went to Nashville, Ga., this week to appear before the Grand Jury of Berrien County in regard to the burning of the dormitory at Sparks, Ga., last December. I had already investigated this fire and turned over what evidence and affidavits I had secured to the solicitor-general and he had me to appear before the grand jury. The grand jury went thoroughly into this case and returned true bills against five of the boys who were attending this school. I am just informed by the solicitor that the sheriff had two of these boys in jail at Nashville and was close after the other three. Leaving Nashville I stopped by Valdosta and learned of a fire that had occurred at Milltown, Ga., a short distance from Valdosta. I began an investigation and secured strong evidence against E. A. Rampey, owner of the gin that burned, and also against Verge Curry. 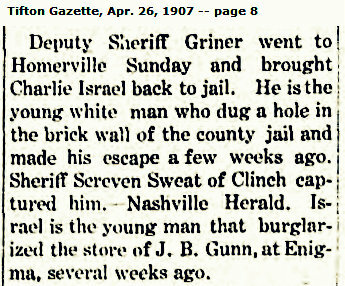 I was satisfied that Rampey hired Curry to fire the gin, so I hurried back to Nashville where court was in session and took the cases before the grand jury, with the result that true bills were returned as follows: E. A. Rampey as accessory before the fact, and Verge Curry as principal. 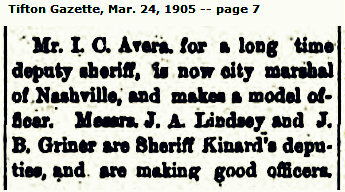 As soon as these bills were returned I had Sheriff Morris and his deputy to go at once to Milltown and arrest both parties. He succeeded in getting both. They were brought before Judge Thomas at Nashville, and he assessed a bond of $5,000 against each of them, in default of which they were put in jail. and convicted and sentenced to serve five years each.were tried and Verge Curry RampeyI attended court M Nashville, Berrien County, for two weeks, trying four cases of arson that I had made on previous occasions. E. A. Expecting communities to deal with incendiaries themselves was perhaps not so wise advice for those who would a few years later face some of the most notorious cases of arson in Wiregrass history.